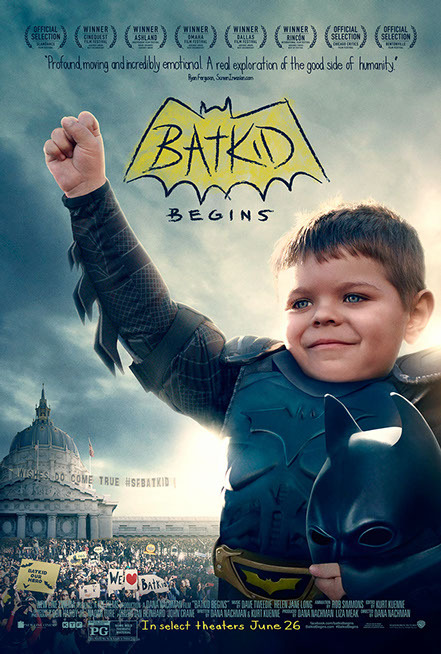 The official trailer, poster and description for the documentary based on the story of Batkid titled “Batkid Begins” has been officially released by Warner Bros.
One child. One wish. Millions touched. Who would have thought a 5-year-old boy who fought leukemia would transform a city and a nation for a day? No one. Not his family. Not his friends. Not the thousands of volunteers who came from near and far to help make his wish come true. But it did. Batkid Begins is a documentary that takes you back to November 15th, 2013, the day San Francisco turned into Gotham City, and the day the internet was nice. More than a billion people took to social media to cheer on BatKid, even President Obama! In all, the #SfBatKid and #BatKid hashtags reached more than 1.84 Billion people on Twitter and Instagram. This wish and this little caped crusader resonated with so many people, including us, and we wanted to find out why.